I love fresh strawberry pie. It makes me think of my mom, as I associate it with her late April birthday. I used local strawberries to make this lightly sweetened pie. I wasn't in the mood to work on a pie crust, so I just made a coconut crust (shredded coconut and melted butter), but really, I'd recommend going to the trouble of a regular pie crust. 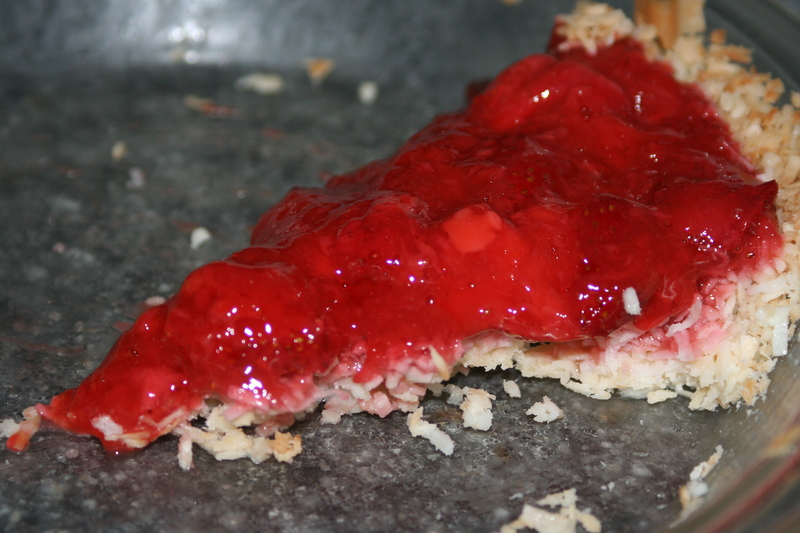 Strawberry pie doesn't keep fabulously well, so you'll want to eat it within a couple days. I have this lovely cookbook devoted solely to pies! I found this recipe in there--fresh berries are mixed in with mashed and lightly cooked berries. It's super easy, delicious, and isn't the deep red color of this gorgeous? Preheat the oven to 425°F. Roll out the dough and fit it into a 9-inch pie pan. Trim and flute the edges, then bake the pie shell fully. Cool completely before filling. Dump the berries into a colander and rinse them. Drain well, shaking to remove excess water, then remove the stems. Pick out about 1 cup of whole berries and reserve for garnish. Cut half of the remaining berries into thick slices (or leave them whole if they are small) and set aside. Put the remaining whole berries in a medium saucepan and crush them with a potato masher. Add the cornstarch, sugar, and salt and stir until the cornstarch has dissolved completely. Cook over medium heat, stirring constantly, until the mixture boils and thickens. Reduce the heat and cook gently for about 1 minute. Remove from the heat and stir in the lemon juice, then cool for 20-30 minutes, stirring 2 or 3 times, until just faintly warm. Stir in the sliced strawberries. Pour the mixture into the pie shell, and refrigerate for 2-3 hours, until the filling is softly set. Before serving, prepare the whipped cream and spread it over the pie. Garnish with the whole berries. Cook's Note: If you want to make this gluten-free, just make a gluten-free pie crust. The pie filling is naturally gluten-free. Additional Note: The photo above is far from my most stellar effort, but alas it was the best I could get. The coconut crust didn't cut well, so creating a pie-shaped piece wasn't all that easy. But, it was tasty! Mmmm the brilliant ruby red of the strawberries is delectable!! This looks really good but I think I'd got for a shortcake type pie base..